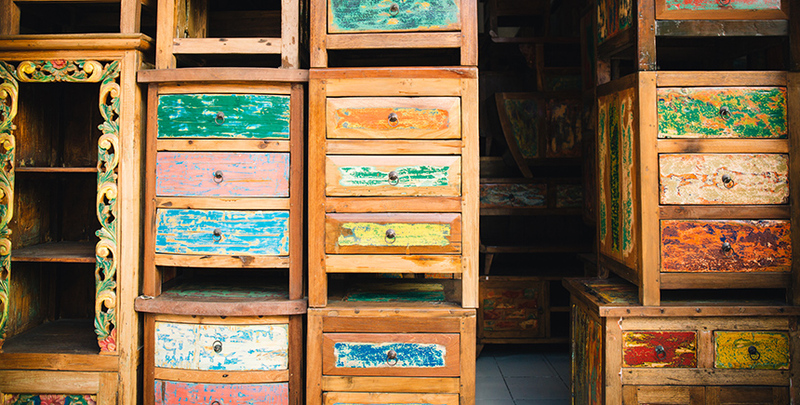 The table was once the hull of one of Bali’s distinctive fishing boats, protected by countless layers of brightly colored paint to protect the wood from the tropical sun and salt of the sea. Jake then sanded the wood to reveal a kaleidoscope of paint beneath and create a singular piece of furniture to complement the shop’s laid-back ocean vibe. I felt like a geologist reading the history of time in sedimentary layers as I leaned in for a closer look. 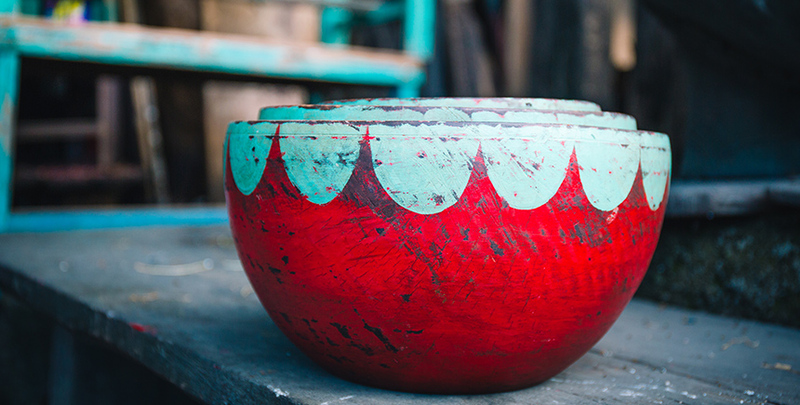 Red, blue, green, aquamarine — each one represents a year on the open sea for the old boat. I’ve been on a home-improvement mission for some time, looking for pieces that not only look good but can also spark a conversation. But it was at that moment, thanks to Jake’s story as inspiration, that my decorating project finally found focus: what if I scoured the island’s many boutiques for pieces that would bring the story of Bali into my living room? And with this theme in mind, that’s exactly what I did that afternoon. First stop: Jalan Kunti II, a twisting side street clustered with a seemingly endless array of interior-design shops. Just 300m east of Sunset Road, the main thoroughfare in Denpasar, the sign for Igun Ku — Boat Furniture and Antiques caught my eye. I thought to myself: Perhaps I might bring a bit of Drifter’s beach-influenced charm back home with me. The shop is crammed to the ceiling with beautiful relics of Indonesia’s seafaring culture. Boat wood has been fashioned to create everything from towering bookshelves to stylish nightstands. With a bit of friendly negotiation, a savvy shopper could bargain for an amazing deal here. 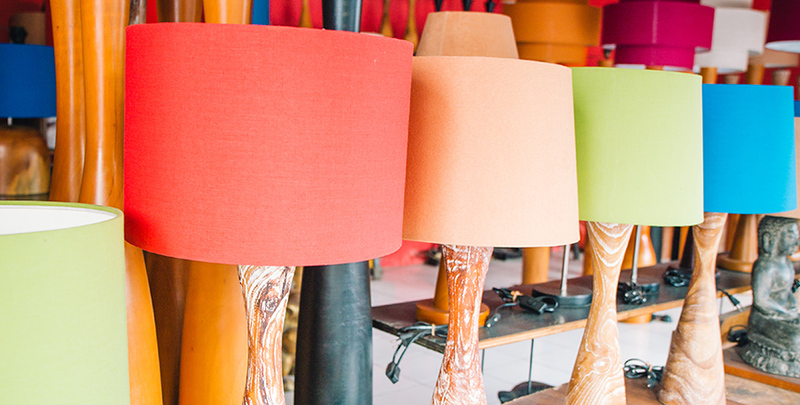 Just a short ride from Igun Ku, the bold colors of the Riyan Lamp Shop grabbed my attention. The style here is retro-chic with beautifully nished teak wood, accented with a strong palette of 1960s primary colors. The red lamp that I was especially drawn to started at US$27 (without any haggling). 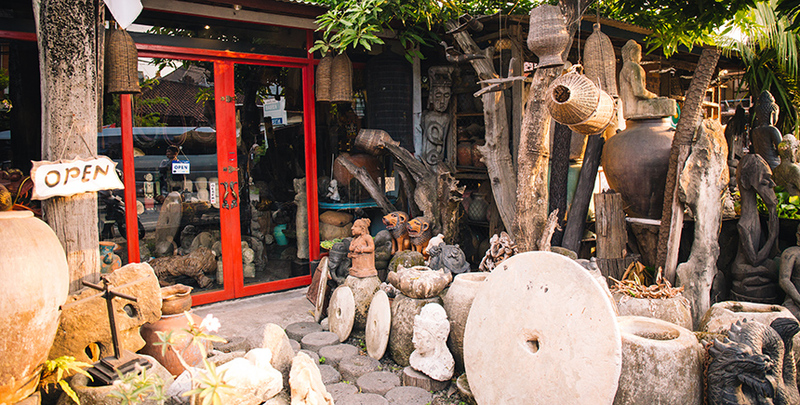 Next stop was Bain Art (Jln Kunti I, Seminyak), the quirkiest stop yet. Antique gongs hang before a showroom crammed with a bewildering collection of carvings, curios and a few things I couldn’t categorize. No worries about buying a “same old same old” gift here! I asked for the price of a set of three hand-painted red mahogany bowls, nestling within each other. Bidding started at just $30. An afternoon of shopping can fly by, and the sun was dipping as I rushed to my last stop — Jaya P. Glass (Jln Kunti I No. 99, Seminyak), purveyors of Bali’s ubiquitous beach bean bags. 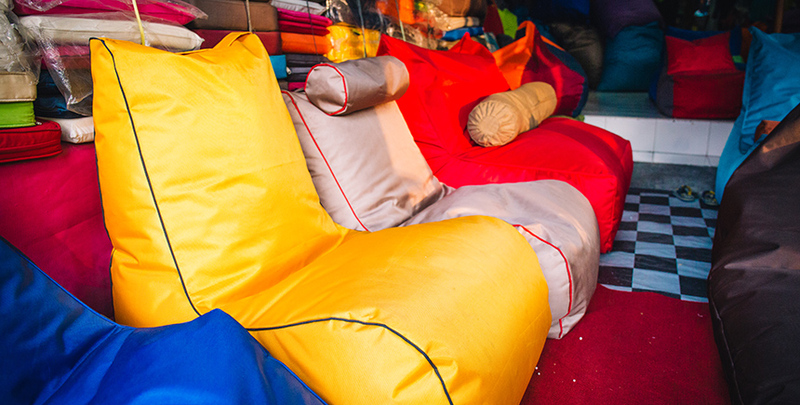 A comfy-looking cobalt-blue recliner beanbag starts at US$39, and an elegant orange velvet pillow hovers around US$6.50. Also at the shop: a bin of crayon-colored “penjors”, a stylized version of the ornamental bamboo decoration used at most traditional Balinese ceremonies. These start at just US$2.70. It’s early evening and the shops here are shutting down, but in just an afternoon of exploring I’ve already begun to discover what designers like Mackenzie have known for years — exploring Bali’s many outlets for interior design can reveal a kaleidoscope of beautiful and unexpected colors. Start low. Offer 50% of the initial price and go from there. Always make eye contact when you make your bid, and keep things friendly with a smile. Talk like a local. Use “berapa harga”, the local way of asking the price. Know your zeros. The Indonesian rupiah is around 13,000 to the US dollar. Take four zeros and about 25% off to quickly convert the numbers. Try not to give yourself away by using a calculator.